If you’re lucky enough to own a Yaesu FT-1000D it a great rig for HF SSTV. I’ve been using my FT-1000D on SSTV since 1995. You can purchase all the parts you need to build up these interfaces from Radio Shack. To receive SSTV you want to use the audio from the AF output jack. This will give you fixed audio level of 200 MV @ 600 ohms. This level is unaffected by the front AF volume control. Note that the audio is on the ring-side of the output jack and not the tip. The Line-In jack on the sound card can be either tip or ring. I prefer to use the ring-side. Usually a 5-foot length of shielded cable is a sufficient length. Next construct the transmitter keying circuit. I always mount the diode, resistor and transistor right inside the DB-9 or DB-25 shell with about a 5-foot cable to the PTT jack. With the cables made up as outlined you are ready for SSTV. However the microphone is hot and will pickup any room noise that occurs. Happily there is a very simple modification you can make on the microphone. Remove the rear shell and you will discover that for some unknown reason Yaesu installed a DPDT push-to-talk switch. Clip the jumped PTT connections on the switch and use the second side of the DPDT switch to silence the microphone. A 470 ohm, 1/8 watt resistor is added to terminate the microphone input line. The microphone gain control on the FT-1000 affects the phone patch input level, so the proper procedure is to first set the mike gain control for normal voice operation with the processor turned OFF. In my case the gain control sits at about 12 o’clock. Voice will modulate about 175 watts peak output power. When you transmit SSTV adjust the 1K pot for 75-80 watts output. This will change depending on the band you operate but you can quickly readjust the pot for 75-80 watts output. Initial setup of the HF Rig for SSTV operation. Connect the transceiver to a dummy load. Turn VOX OFF. Turn speech processor OFF. If your radio has a MONI function turn it ON. Turn RF PWR full clockwise for 100 watts output. Adjust MIC gain control for 100 watts peak output. Connect the interface cables and turn the SSTV gain control full clockwise. preferences, then click on the SSTV TAB, Check Use PTT, then select PTT COM #1 and last select USE RTS for PTT. Now click the OK button. You can make the following adjustment either by loading a picture and clicking transmit or you can click on tab 2, set the test tone for 5-10 seconds, click on 1200 Hz button. In either case your transmitter should key on and you should see RF power output. says "Open volume controls." Click on Open volume controls and you will see several gain controls. Adjust the "Volume Control" slider so that you have 100 watts RF power output. Set the Line Input control for Maximum gain. You are now ready to transmit SSTV pictures. You want to always set the SSTV gain pot on your interface box to run 50 watts RF output. I have found that this adjustment changes a little as you change bands. Most all HF transceivers are not rated for 100% duty cycle and SSTV is a KEY DOWN mode. 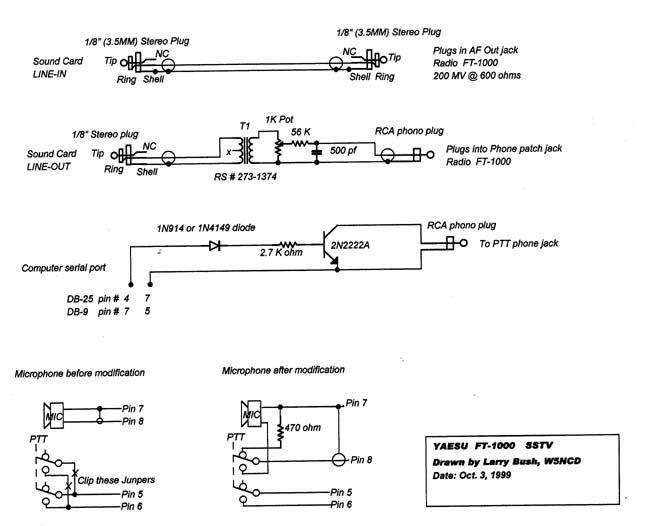 Don't use the transceiver VOX circuit to key the transmitter.